As Paul VI 50 years ago, although in different context, Pope Francis comes to Cova da Iria, on May 12th and 13th, as a “pilgrim among pilgrims”, to celebrate the 100 anniversary of the Apparitions of Fatima. Fifty years ago, in a context of tension with the Portuguese authorities because of the participation of the Pope in the Eucharistic Congress of Bombay, in India, in December 1964, three years after the taking of Goa, Daman and Diu by the Indian forces, Paul VI had expressed his desire to visit Fatima to mark the first fiftieth anniversary of the Apparitions of Our Lady to the Little Shepherds. A visit that eventually happened following an invitation from the Portuguese bishops and only to Cova da Iria, a way of avoiding any interpretation of legitimation of the Portuguese regime at war with independence movements of the colonies. Prime Minister Oliveira Salazar considered to forbid this visit, according to the account of Franco Nogueira, minister of Foreign Affairs, by not conceding the needed visas, but accepting nonetheless the trip formula of being a pilgrim who comes to Fatima. That is why the plane that brought the Pope to Fatima didn’t land in Lisbon but 40 km away from Fatima at the air base of Monte Real, where he was received by the civil and religious authorities (including the president of Portugal, Admiral Américo Tomás, and Oliveira Salazar, as prime minister). Paul VI, who stayed in the then diocese of Leiria, was driven to Fatima in a convertible car of the Portuguese presidency among thousands of pilgrims. Francis comes to Fatima now in a totally different context but with the same motivations, to pray, with the Portuguese people, next to the statue of the Virgin Mary, in one of the biggest Marian shrines in the world. As it happened 50 years ago, the plane that transports the Pope lands at the air base of Monte Real and Francis continues his way to Cova da Iria by helicopter. Francis was invited by the Portuguese bishops and the President of Portugal, but as 50 years ago, this visit involves only Fatima, sign if his Marian devotion. Elected Pope on March 13th, 2013, his connection to Our Lady of Fatima, as Supreme Pontiff, began officially two months later when the Portuguese bishops, on his demand, dedicated his pontificate to Our Lady, during the celebrations of May 13th, in Fatima. As example of his Marian devotion was his explicit request to bring the statue of Our Lady, venerated in the Chapel of the Apparitions, to Rome for the Marian Day organized by the Pontifical Council for Promoting New Evangelization in the context of the Faith Year. In 2015, Pope Francis shared in the celebration of May 13th, by evoking in Rome some crucial contents of the Apparitions in Fatima, from May to October 1917, to the three seers, Blessed Francisco and Jacinta and Sister Lucia. 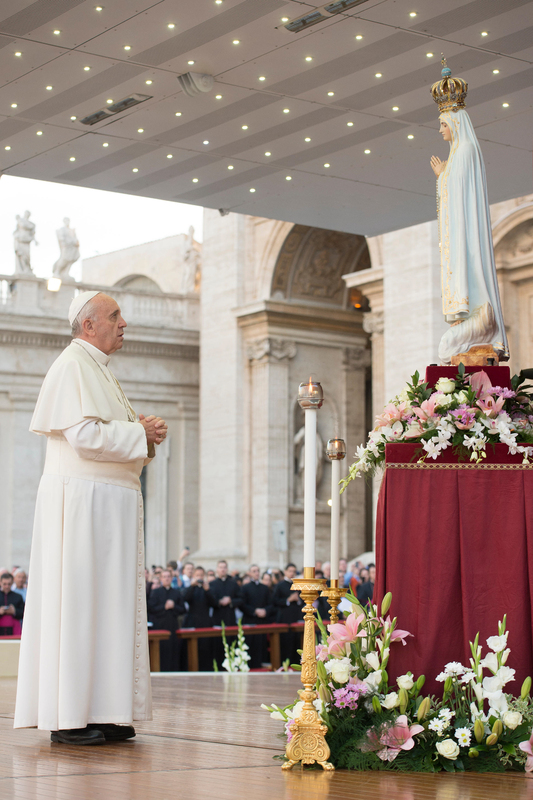 During the catechesis of May 13th, 2015, the Pope asked the Portuguese reader in Saint Peter’s Square, in Rome, to pray aloud a Hail Mary to highlight the day in which the Church reminds Our Lady of Fatima: «I will ask my Portuguese brother to pray in Portuguese in this day of Our Lady of Fatima». Francis had expressed his intention to be in Fatima for the international anniversary pilgrimage of May; his wish was communicated to the catholic bishops of Portugal in September 2015, at the beginning of the ad limina visit. (the ad limina visit, or fully ad limina Apostolorum –of the tumbs of the Apostles, in Rome – is the name given to the obligation of the diocesan bishops of a country of going to Rome, every five years to deliver an account of the pastoral situation in their dioceses and to reflect with the Pope, by listening to his advices and recommendations). During the general audience of May 11th, 2016, Pope Francis has shared in the celebration of May 13th, in Cova da Iria, and reminded the devotion of John Paul II to Our Lady of Fatima: «In this apparition, Mary invites us once more to prayer, penance and conversion», said the Pontiff in front of thousands of people gathered in Saint Peter’s Square. On that same day, the official account of Pope Francis in Instagram included a picture of Our Lady of Fatima, subtitled «Mother, we thank you for your faith; we renew our entrustment to you». The Shrine of Fatima owns a palce called Pope Francis Youth Space directed to youth who is the living and dynamic force of the Church. Francis will be the fourth Pope to come to Portugal after Blessed Paul VI (May 13th, 1967), John Paul II (May 12th – 15th, 1982, May 10th – 13th, 1991 and May 12th – 13th, 2000) and Benedict XVI (May 11th – 14th, 2010).